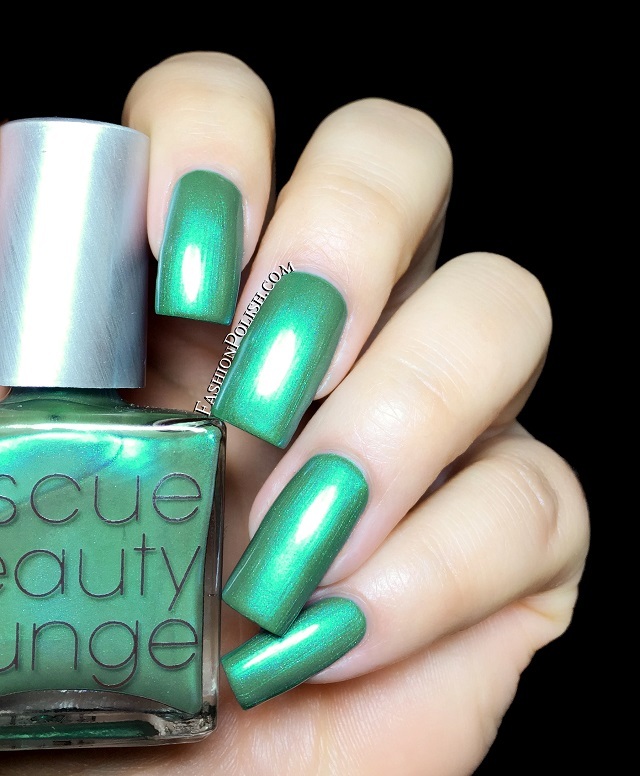 Fashion Polish: R29 + Rescue Beauty Lounge collection swatches and review! 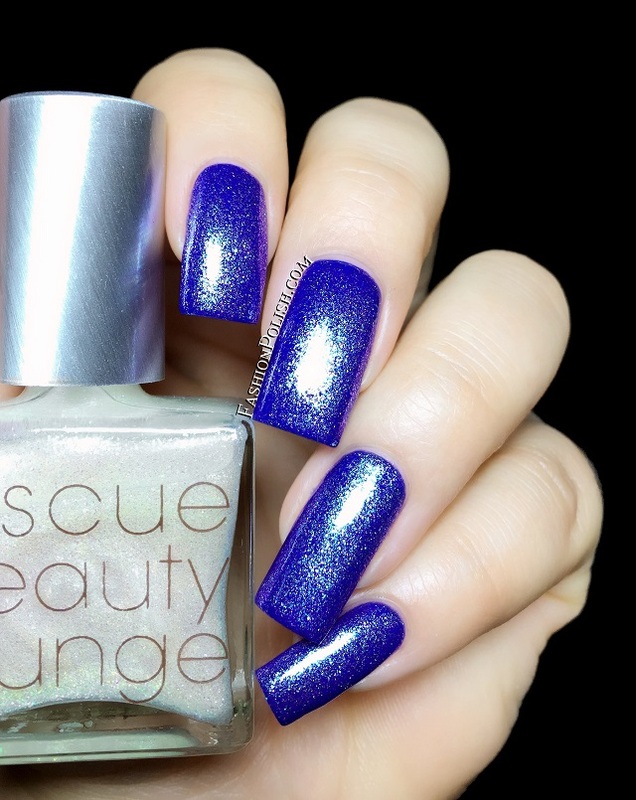 R29 + Rescue Beauty Lounge collection swatches and review! 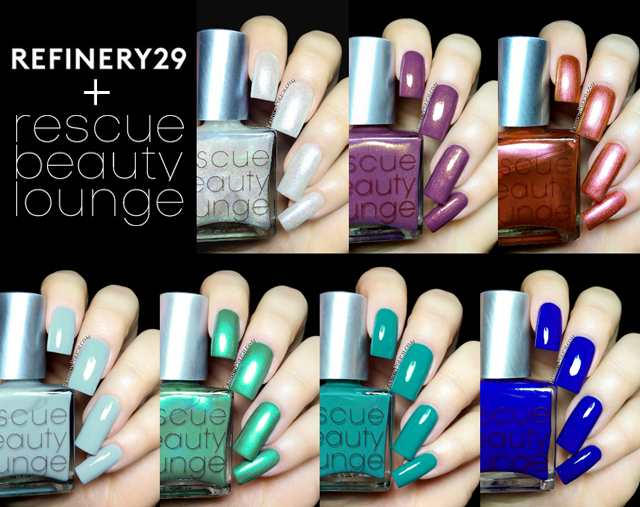 The R29 + Rescue Beauty Lounge collection, a set of 7 unique nail colors, representing 7 Refinery 29 teams. "Introducing our first ever collaboration outside of the ReBeL community bubble. We paired up with the ever-clever, witty folks behind my daily obsession –Refinery29. I like to think I’ve earned a doctorate on making people’s dream colors come true. My dissertation was the past two The Bloggers’ collections as well as The Fan Collection. I even had a slightly mean-girlish thought: For real, I mean, what do you non-lacquer heads know (except maybe the beauty department) about nail polish? I thought I was going to sail away with this collaboration. But of course, I should’ve known, that dark shadow “karma” took a huge bite out of my *ss because I jinxed myself with my smugness and judgments. The moment our union commenced, the seven Refinery29 teams submitted their dream color inspirational boards. My head spun! I’ve never mixed so many colors IN MY LIFE!" "There is nothing more comforting than your favorite faded jeans. That soft, over-washed fabric reminds you of carefree, relaxed, and lazy Sunday afternoons. 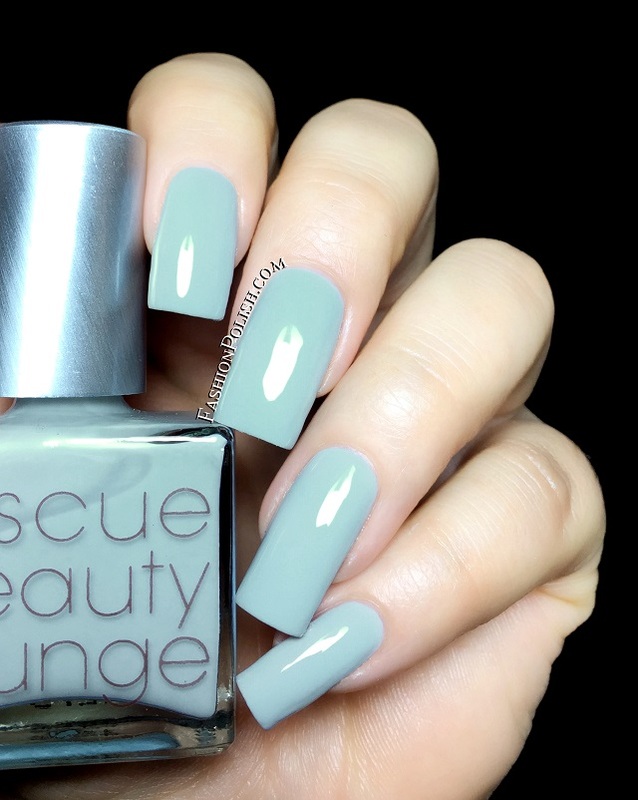 This cream jelly applies smoothly, a perfect open marriage of a faded blue that turns a tad gray at the end. If Concrete Jungle and Bikini Bottom had a baby—this would be IT. So easy, so everyday, and boyfriend who?" Better Than Boyfriend Jeans is a soft grayed-out pastel blue with a semi jelly consistency. Everything is perfect about it, the color, the finish, everything. I used 3 thin coats plus topcoat but you'd most probably get away with 2 on shorter nails. "A perfect balance of blue (often associated with depth and stability), green (it symbolizes growth, harmony, freshness, and fertility) and a dash of yellow (The color of sunshine. It's associated with joy, happiness, intellect, and energy). Remember finding sea glass this color on a beach, holding the translucent object up to the sunlight as the sky peeks through? 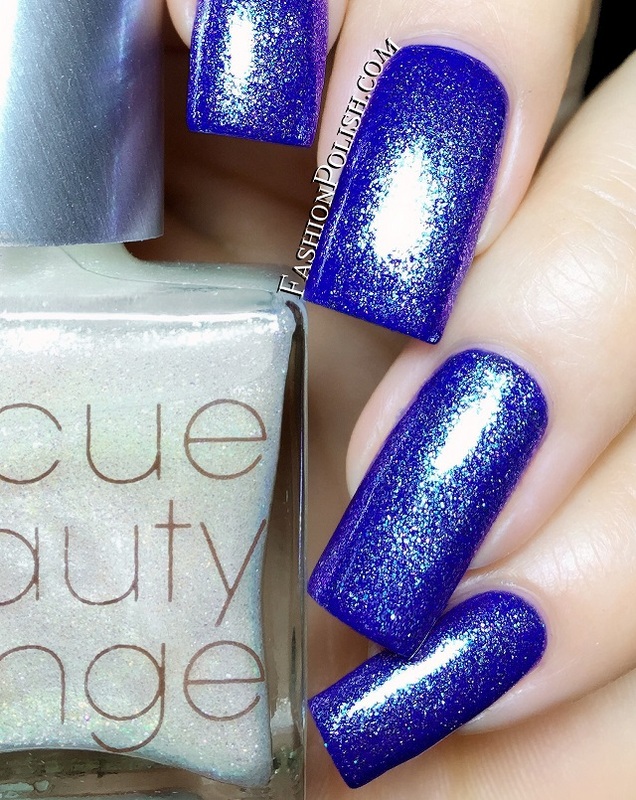 Here comes this super-shiny opaque, a highly pigmented one-coater with its sorcery-like application. Vivid and vibrant, this seafoam green is witty, yet unexpectedly neutral—it reflects that tranquil feeling after a major workout as you sit, soaking in your well-earned sweat." 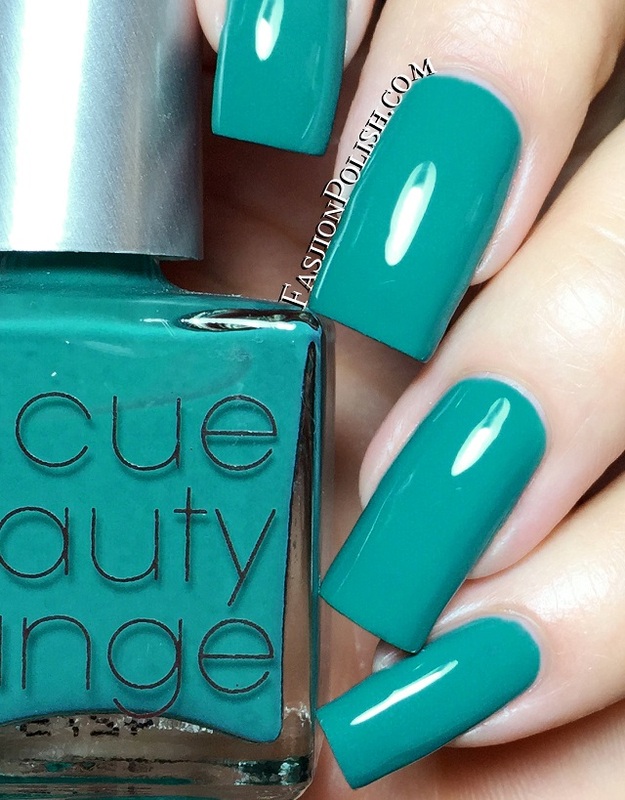 Sunny Skies is a gorgeous seafoam green creme. 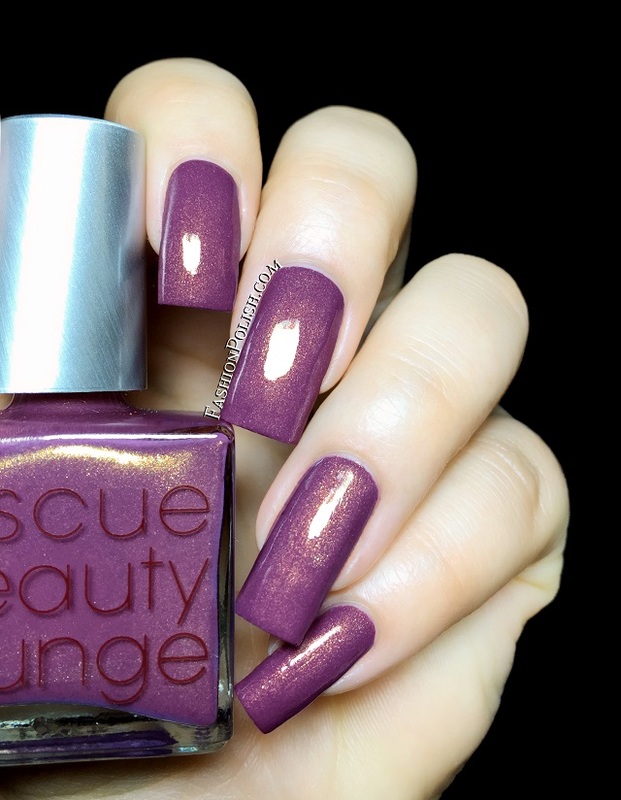 One of my favorites in the collection, I don't think anyone makes cremes better than Rescue Beauty Lounge, I am seriously in love. Application was flawless, thin but pigmented. One coat would have been sufficient in "real life", I decided to add a second for swatching purposes. 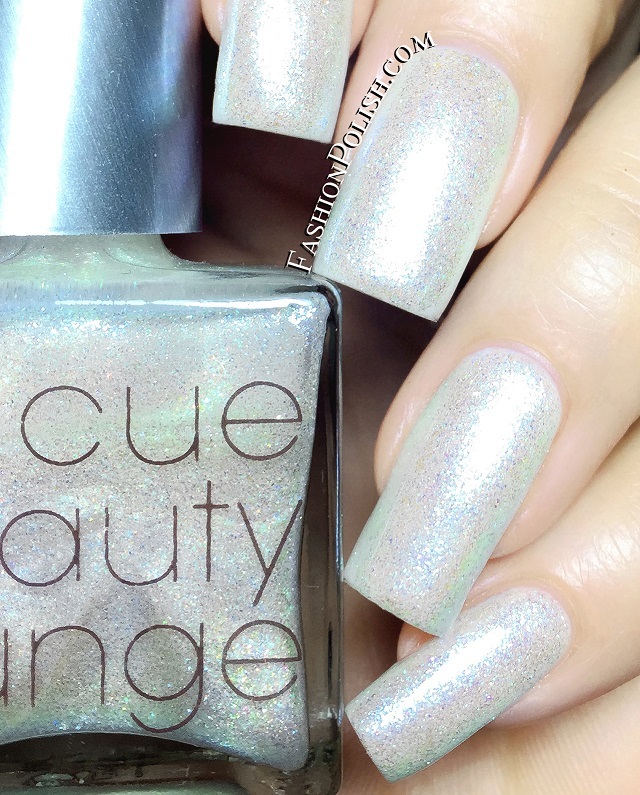 "In the fashion milieu, people rarely wear polish on their nails. I was dreading that this team might want something like a clear-buff-no-polish nail polish. To my surprise, they wanted the exact same color as that elusive Céline oversized coat that got way from me (still obsessing over it). This is a slightly darker kissing cousin to our wildly popular (and sold out) IKB: 2012, a cream jelly, pigments on steroids. The team was right; this color is universally flattering, a bold neutral. All About Yves is definitely a statement nail polish color." 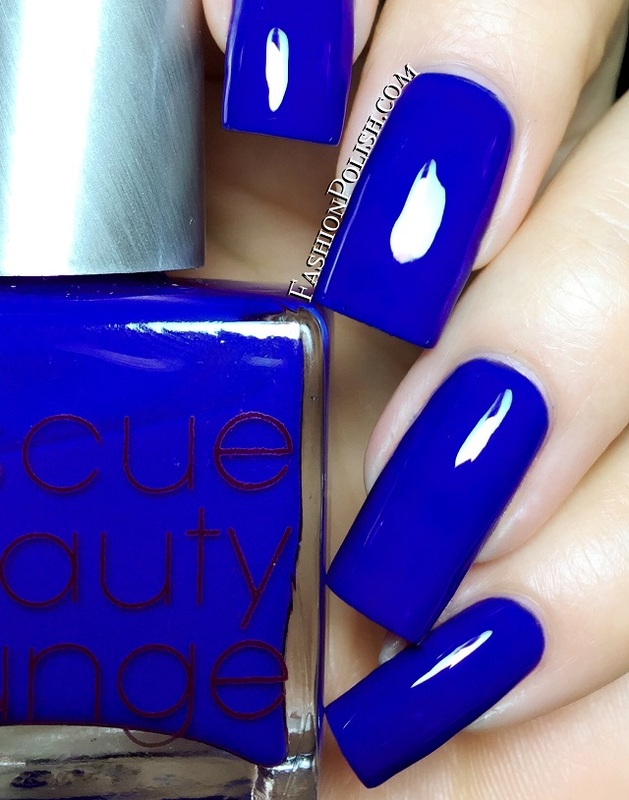 All About Yves is a heart-stopping, jaw-dropping, mega-swooning, YSL blurple blue creme. If you missed (or loved) IKB : 2012, there's no doubt you'll need this one. 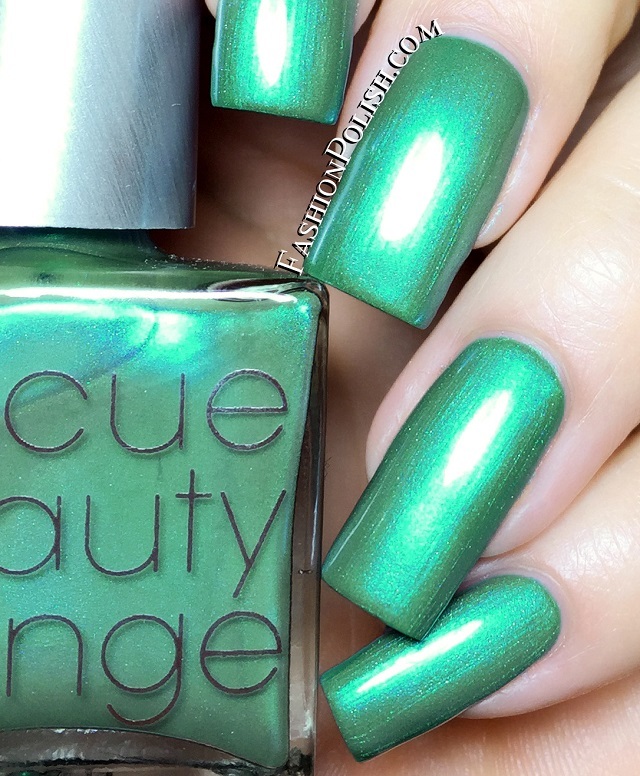 Top notch formula and an easy 2 coats coverage. "The request was “various shades of purple roughed up.” As a frequent color pigment tormentor, I’ve roughed up my fair share of colors, and this one gave me a fight right back. The result is a dusty, mauve-esque medium purple with various sizes of gold shimmers. 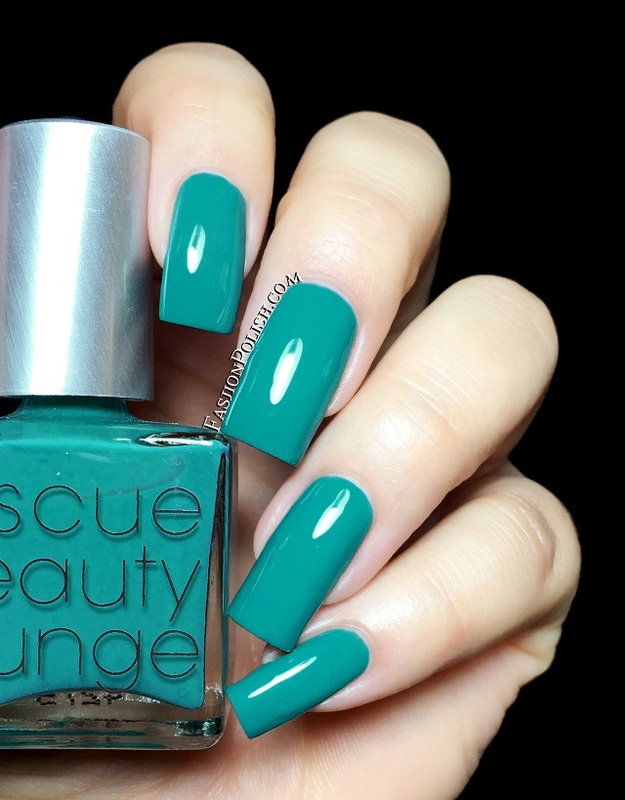 This color has a composed glow and radiance that’s very flattering, making it work and life appropriate. Pretty Gritty complements every skin tone with an edgy twist." 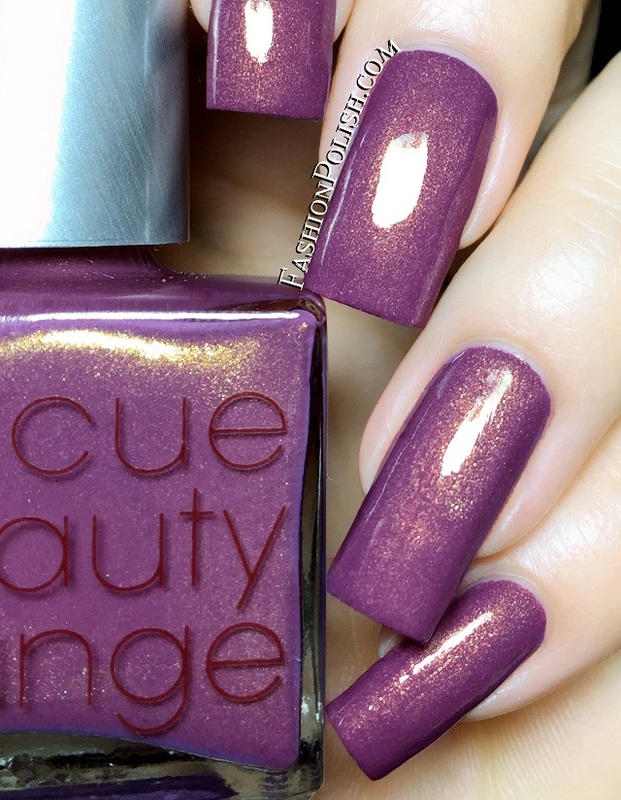 Pretty Gritty is another of my favorites : a warm, complex, opulent, purple, infused with heavy gold shimmers. I think I need it in every possible color.. Again, nice and easy application, 2 coats used below. "I promise, it’s nothing like actual glue, but you can see the galaxy in here. There is a depth of sage and blue and you can catch the micas that shimmer and twirl in the light. In bright light, you can see the turquoise-bright apex, which becomes darker with a brown tinge as you move your hands. This mesmerizing galaxy of colors will no doubt keep everyone’s eyes glued to your fingertips!" Galaxy Glue is an ethereal mix of bright turquoise shimmers dancing in a muted sage green base. I don't think I've ever seen anything quite like it, such a strong and vibrant contrasting shimmer flash. Shown below : 3 coats plus topcoat. "They had me at the iridescent-rainbow-hued cellophane on their inspiration board and a photo of Natalie Portman wearing the pink wig from the movie “Closer.” This color appears innocent from afar, but as you get closer, nothing is ever what it seems—mirroring the changes that may occur chasing down a breaking news story. The first coat goes on sheer, with an innocent silver white shimmer base that glints with a sparkling of blues, pinks, greens and a dash of gold. Although fitting for any mayor’s press conference, you can add some punk attitude by layering it with a different base color. Apply two to three coats? I see the colorcast changing like a prism. This is when that cellophane effect magically appears, covering this color in a fairy-like sheen." 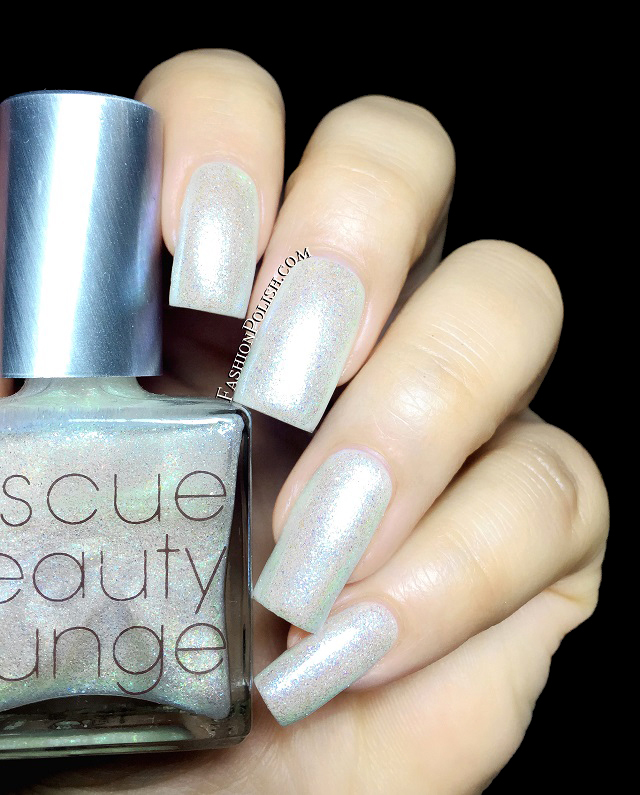 Bubblegum Punk is a heavy mix of pearly white multicolored iridescent shimmers. So much sparkle and dimension! It can be worn alone or layered, I decided to pair it with Bella from the GOMM collection and All About Yves. Shown below : 2 coats plus topcoat. "To my astonishment, the colors I came up with were rejected many times by this team. This copper required the most rounds of color mixing in the history of RBL (and we’re talking depuis 2000). There were batches and batches of colors made, I dreamt of copper, I saw copper everywhere, and I even stripped a wire to study the copper inside. I pictured Elvis wearing copper aviators furiously pinging back and forth from Earth to the clouds. When the team approved this color on my birthday—it was the best gift ever (yeah, I even shed a perfect single tear). It was all worth it because this is the PERFECT copper, not too yellow, not too gold, not too pink, and not too red—simply meticulous, like their coding!" 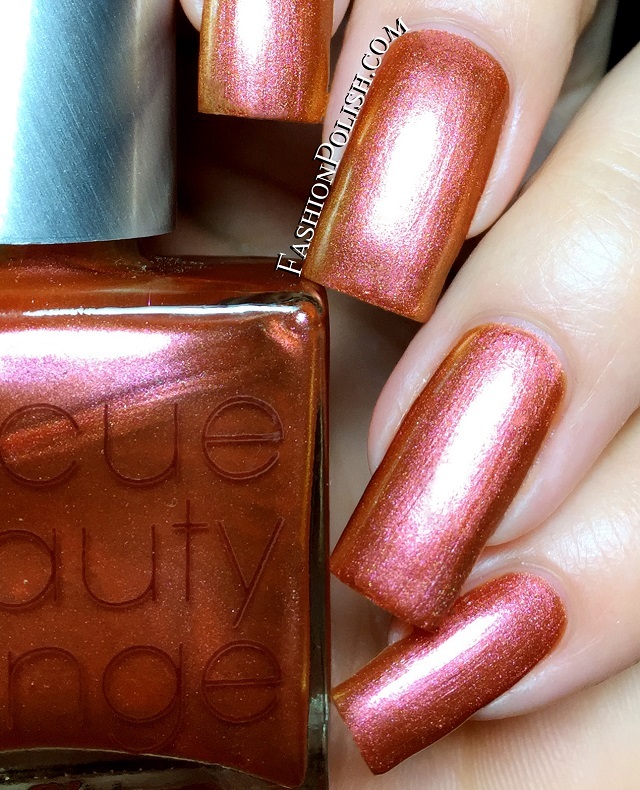 Elvis In The Cloud is a bright copper shimmer duochrome : pink in the middle and orange, almost gold around the edges. 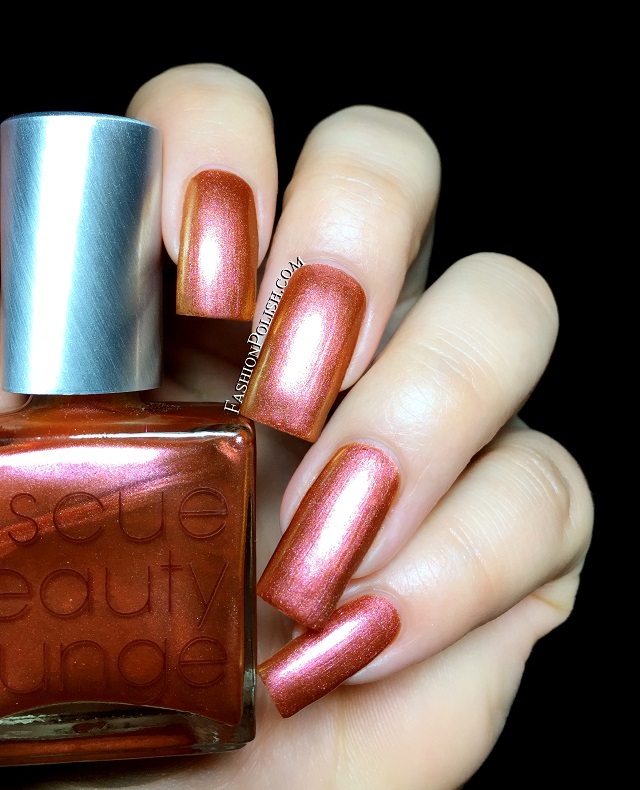 I can't think of another non-metallic polish that would mimic actual copper better, Ji pretty much nailed it with this one. An easy 2 coats coverage with minimum brushstrokes. 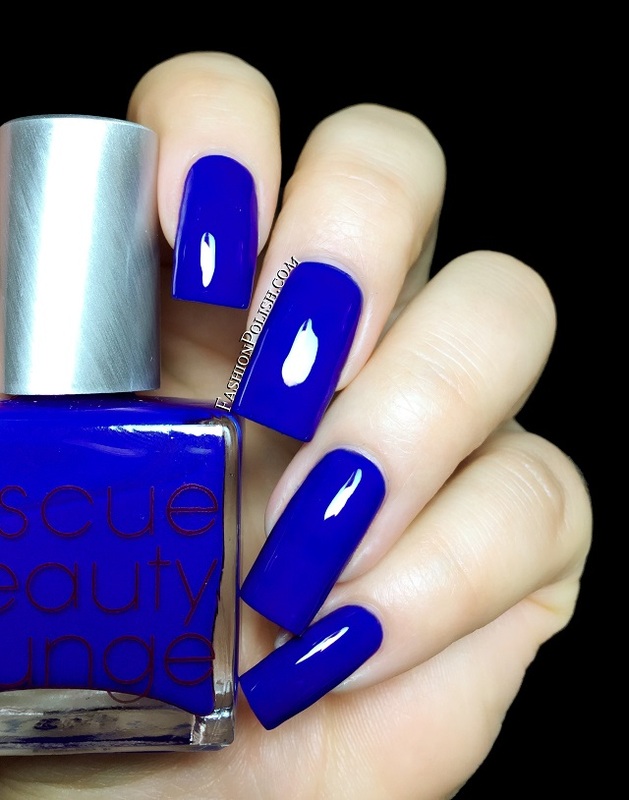 The R29 + Rescue Beauty Lounge collection is available NOW on RescueBeauty.com (no pre-order). I can't wait to hear your thought on these! Do you have any favorites? Mine are All About Yves, Better Than Boyfriend Jeans, Pretty Gritty and Sunny Skies!